Build the legendary 911 GT3 RS yourself from more than 2,700 parts: as of now, you can make this dream come true – with the Porsche set from LEGO Technic. The aerodynamic body is just as faithful to the original as is the interior. Be it the racing seats, dashboard or glove compartment with unique serial number – the cockpit of the 911 in the LEGO model has been modelled with a great deal of attention to detail. One extra-special detail is the Porsche PDK dual-clutch transmission with four gears and shift paddles on the steering wheel. The orange super sports car fitted with red axle springs, brake callipers and rims in original design additionally features special low-profile tyres. And under the hinged luggage compartment lid is a storage compartment complete with suitcase. The assembled LEGO Technic Porsche is in 1:8 scale. It is 17 cm high, 57 cm long and 25 cm wide. Also contained in the set is a booklet with comprehensive background information on the development of the LEGO Technic 911 GT3 RS. For the first time, the elements of the individual assemblies are also packed in their own separate boxes and, together with the detailed building instructions, give some insight into the assembly process of the actual vehicle. The Premium Collector’s Edition from LEGO Technic is available in the Porsche Online Shop at www.porsche.de/shop as well as at LEGO.com/shop and from retail outlets. Lego™ bricks let you create entire galaxies, so why shouldn’t you be able to create Porsche race cars too? 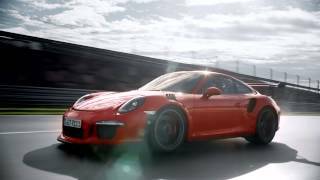 The new Porsche 911 GT3 RS – Paparazzi.